Ever since the Nepal earthquake in 2015, the Zhangmu border port had been closed between Nepal and Tibet. The overland option to travel between Nepal and Tibet had thus ceased for over 2 years for foreign travelers. At long last, on 30 Aug 2017, a border port called Gyirong has opened in its place to foreign travelers. For many, Gyirong Port is a place you’ve never heard of until you start to plan you Nepal-Tibet tour. So how to travel from Nepal to Tibet via Gyirong Port? Here Tibet Travel Expert provides you with a detailed rundown about everything you needed to know of Nepal Tibet overland tour via Gyirong Port. Gyirong Port, also spelled as Kyirong or Keyrung, is located at Resuo Village, Gyirong Town, Gyirong County of Shigatse Prefecture. 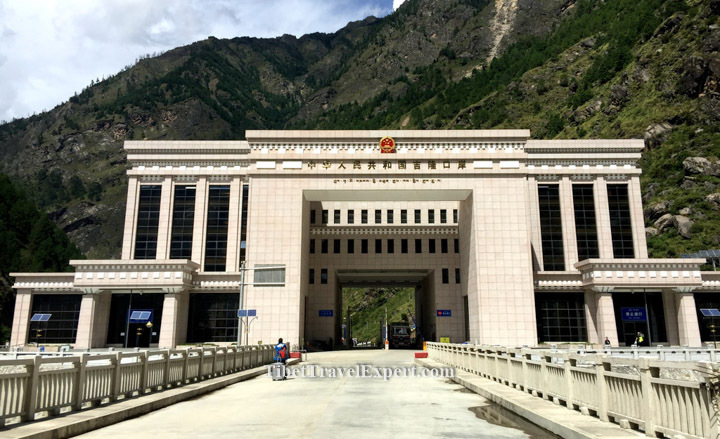 Gyirong Port, lying on the Tibetan side of the Resuo Bridge, is the Chinese Immigration checkpoint. In correspondence with Gyirong Port, Rasuwagadhi Fort, lying on the Nepali side of the Resuo Bridge, is the Nepali Immigration checkpoint. To travel overland from Nepal to Tibet via Gyirong Port, you need two documents: Chinese Group Visa & Tibet Permit. Chinese Group Visa, isn’t the usual Chinese visa of a page in your passport, but a separate sheet of paper document, used especially for travelling from Nepal to Tibet. It can only be done after your arrival in Kathmandu with your original passport, and it takes about 3 working days. Chinese embassy in Kathmandu is open on weekdays, except Nepalese and Chinese holidays. You can travel overland from Kathmandu to Gyirong with Chinese Group Visa alone, but your Tibetan guide needs to bring Tibet Permit to Gyirong Port for the rest of your journey in Tibet. It is about 175km between Kathmandu to Gyirong Port. However, because the road condition is bad, the whole trip would take 9 hours. We usually depart from Kathmandu at 5 or 6 am. And Rasuwagadhi/Gyirong Port runs as a common government office which have daily working hours till about 05:30pm. Please note that the port closes around 4 or 5pm. Therefore, we suggest that you use Nepali drivers who are the most familiar with this route. The majority of the road is windy and narrow. Sometimes there is even only one lane. Although it will be a long tiring ride, the countryside view does prove rewarding. Starting from Kathmandu, we head north to Bidur, the largest town in this ride. From Bidur, we pass the edges of the famous Langtang National Park. As we drive further into the mountains, the road becomes narrower. This is when traffic jam is most likely to take place. We continue to drive along the Trishuli River that flows down from the mountains at the border before reach Rasuwagadhi Fort at the Trishuli River Gorge crossing. You will then arrive at Gyirong Port and pass the immigration. Our guide and driver will wait for you once you cross the border. To travel overland from Nepal to Tibet via Gyirong Port is an exciting journey. However, it does have many flaws. To travel in this direction, the altitude gain is huge and rapid. Right after your arrival at Gyirong Port (1850m), you will be transferred to Gyirong Town (2700m). Afterwards no matter you will visit Mt Kailash, or Mt Everest, or the relatively better option to go straight to Lhasa, the altitude gains can’t be avoid. The solution is to have an extra rest day in Gyirong Town to give your body time to acclimatize with the higher altitude in Tibet. To travel overland from Tibet to Nepal via Gyirong Port, you will need two documents as well: Chinese Visa (of Chinese Group Visa if you fly to Lhasa from Kathmandu earlier) & Tibet Permit for your Tibet journey to Gyirong Port. After cross the Resuo Bridge, you will arrive at Rasuwagadhi Fort, Nepal side of the border. Here, you can have Nepal visa-on-arrival for about USD 25. At Rasuwagadhi Fort, there are buses, taxis, and jeeps for hiring to take you to Kathmandu. Unlike the other way around, when one want to make it on time before the immigration offices closed at Rasuwagadhi/Gyirong, the ride from border to Kathmandu is much more relaxing. There is no accommodation at Gyirong Port itself. The nearest accommodation available is at Gyirong Town. It is about 25 kilometers north of Gyirong Port. You can find humble guesthouses there. Gyirong Town is a small one, newly built with clean streets. Tibetan and Nepali food are most commonly found here. Gyirong is a remote border town which are not as excited as major cities, but for travelers it is an excellent place for stopover where a night’s good rest is assured.